Select the Playback tab on the left edge of the window. Linear: This option forces learners to navigate through the interaction in the order you've designed, using the previous and next buttons on the player. 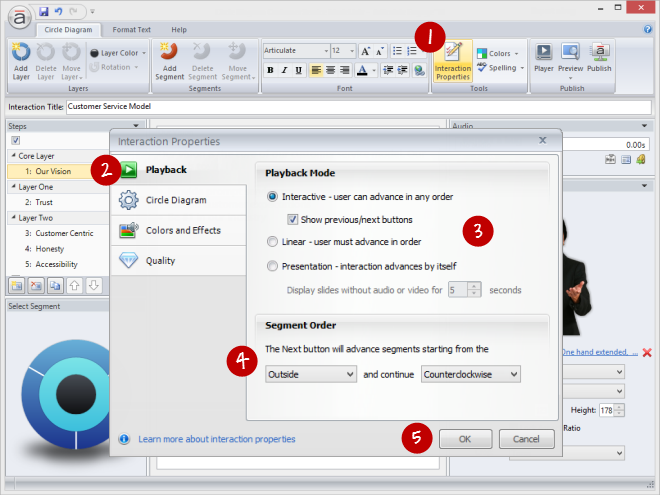 Presentation: This option advances the interaction automatically, in order, without any involvement from learners. Each step will display as long as it takes to complete the audio or video for that step. Steps that don't contain audio or video will display for the number of seconds you specify. If you're building a Circle Diagram or Pyramid, you'll see a section called Segment Order where you can specify the starting point for the interaction and the direction in which it advances.